Christmas is fast approaching and with it, the advent season. In our family, we try to make this a special time to focus on Jesus in the lead-up to Christmas day. 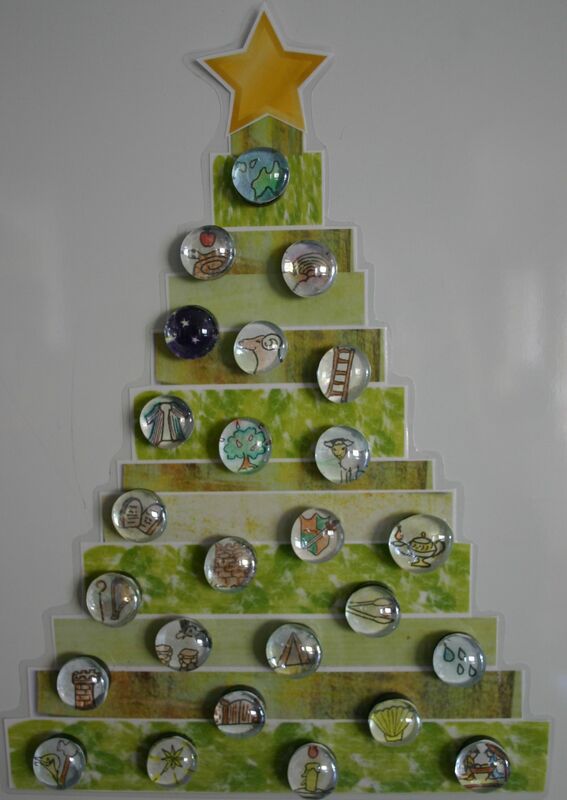 This year we are making a magnetic Jesse tree to count down the 25 days of December. The clear jewels that are stuck over the top of the tiny pictures have a magnifying effect that make the simple picture symbols look quite spectacular. 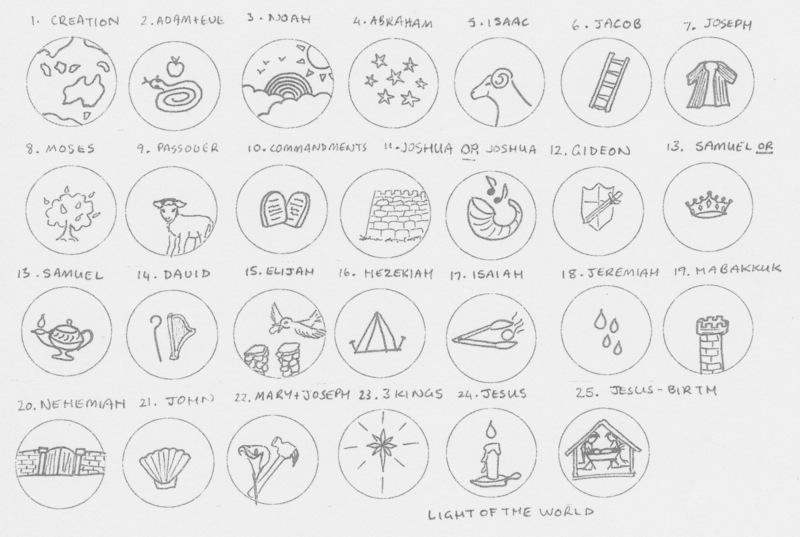 We will read the bible reading to go with each symbol and the older children will design their own pictures, while the younger kids will colour in the ones I have already pre-drawn for them. If you would like to use our pictures, I have uploaded a printable version here. (You are welcome to print the pictures out for your own use, however please do not re-post these on any other blog; feel free to link back here.) Don’t forget to check the size of your jewels and adjust the print size of the pictures accordingly. Jewels can be found at discount variety stores and are usually with the candles or artificial flowers. The tree backing is simply strips of coloured paper glued down and laminated. If you can find a couple of complimentary scrapbooking or wrapping paper patterns that would be ideal. To glue the jewels down, we used white PVA wood glue. Just make sure that whatever you use, it dries clear or obviously your pictures will not show through well. I found round magnets and used the same glue to attach them to the back after the pictures were dry. If you would like to see another version of a fairly traditional Jesse tree from previous years, see here or for a different take on Jesse trees, see our names of Jesus Jesse tree symbols. Jesus trees, lent and Easter traditions for a Christian Easter; minus the bunny. The suggested readings link is no longer reachable. Do you have a copy of your readings? Hi Tania, thanks for letting me know. I have uploaded a printable list and updated the post so hopefully that gives you what you need. I haven’t checked through to make sure that the readings match the printable symbols for the jewels but they should cover them all.